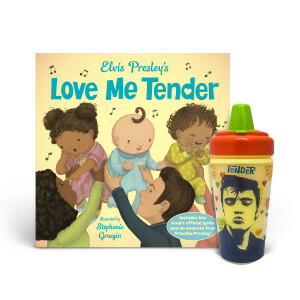 Celebrate the King and his tender ways, with this beautifully branded Elvis, Love Me Tender sippy cup. Designed to pay homage this iconic, the cup pictures a young Elvis surrounded by signature hearts and the love Me Tender message. Perfect Sippy Cup for any little one! It has a locking spill-proof lid, an easily-clean soft spout, and is made of strong, durable plastic.